¶ 1 Leave a comment on paragraph 1 0 John Hammond signed the 20-year-old Dylan to Columbia Records in 1961 and served his producer on this first recording. Hammond was a legend at Columbia, having signed and produced many celebrated artists including Billy Holiday, and late in his career, Bruce Springsteen. Hammond’s colleagues at Columbia were less than impressed with the scruffy kid with the weird voice. They referred to him as “Hammond’s folly”. ¶ 2 Leave a comment on paragraph 2 0 Recording sessions for folk artists in the early sixties were often slapdash affairs. 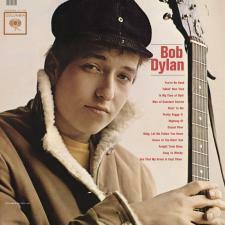 The first Dylan sessions were loose even by that standard. There was practically no planning. 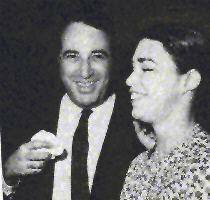 According to Dylan, during the sessions Hammond suggested songs for him to perform, and if he happened to know the song, they recorded it. 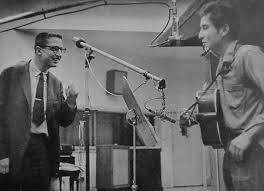 ¶ 3 Leave a comment on paragraph 3 0 Dylan researcher Clinton Heylin notes that there is no record of Dylan having played several of the songs that appear on the recording before the sessions. Dylan obviously knew them, but they didn’t seem to be part of the standard repertoire of songs he was playing around New York City at the time. That doesn’t seem to be any way to run a railroad. ¶ 4 Leave a comment on paragraph 4 0 I don’t think many would argue that this first record is anything truly special. The album includes only two original songs, both good but nothing exceptional. The rest are covers of well-known folk, blues, and country tunes. Although the covers are performed with verve and originality, at twenty-one Dylan was not ready to sing the blues like he did in on his 1993 release, World Gone Wrong. ¶ 8 Leave a comment on paragraph 8 1 Shelton was one of Dylan’s earliest supporters. 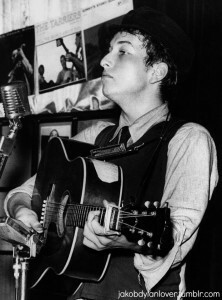 He described Dylan performance in his September 29, 1961 New York Times review of Dylan’s gig at Gerde’s Folk City, about five months before Dylan’s first album was released. ¶ 9 Leave a comment on paragraph 9 0 Mr. Dylan’s highly personalized approach toward folk song is still evolving. He has been sopping up influences like a sponge. At times, the drama he aims at is off-target melodrama and his stylization threatens to topple over as mannered excess. ¶ 10 Leave a comment on paragraph 10 0 But if not for every taste, his music making has the mark of originality and inspiration, all the more noteworthy for his youth. Mr. Dylan is vague about his antecedents and birthplace, but it matters less where he has been than where he is going, and that would seem to be straight up.